The Brewers Association came out with some interesting numbers for the craft beer industry for 2012. American craft beer exports are the subject of this new press release issued today. Way to go American craft brewers! [PRESS RELEASE] Boulder, CO • March 12, 2013 — The Brewers Association (BA)—the not-for-profit trade group representing small and independent craft brewers—today reported that the American craft beer industry set a new record for exports in 2012. Based on results from a recently-completed industry survey, craft beer export volume increased by an astounding 72 percent compared to 2011, with a value estimated at $49.1 million. Canada remained the industry's largest export market, with shipments increasing 140 percent by volume (up to 68,180 barrels) in 2012. Significant gains have been made in Ontario and British Columbia, and American craft beers are now gaining distribution in other provinces. 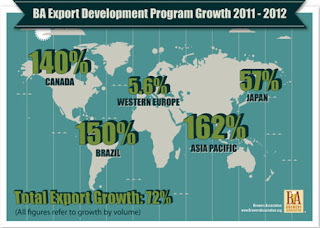 "The BA is very pleased with the continued growth in exports of American craft beer to markets around the world. Consumers continue to view American craft brewers as leaders in innovation and among the standard bearers for quality. Maintaining that perception is a priority for the craft brewing community,” said Bob Pease, chief operating officer, Brewers Association. - Help brewers get their kegs back with Keg Return.